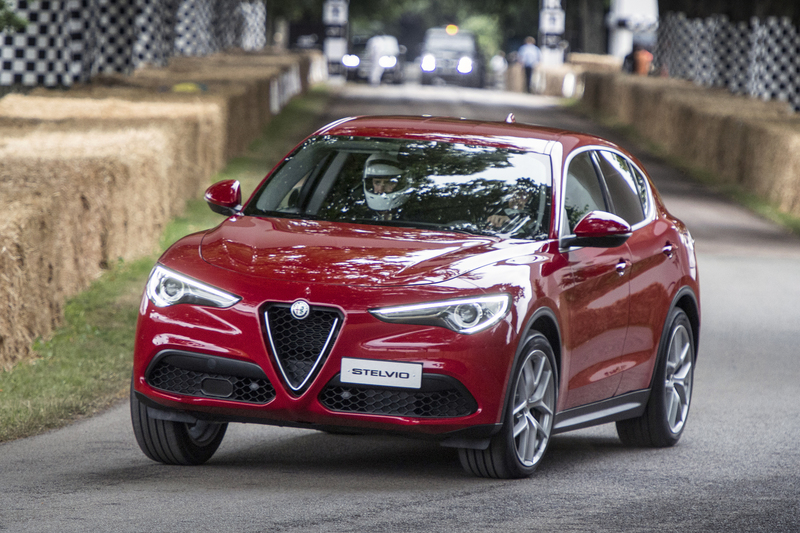 Following its UK debut at Goodwood Festival of Speed last month, Alfa Romeo has revealed the UK pricing and specification for its first ever SUV, the all-new Alfa Romeo Stelvio, with prices starting from £33,990 OTR. The Alfa Romeo Stelvio launches with an exclusive version for 2017 – the Milano Edizione to offer customers even greater functionality and style, while providing exceptional value for money. Four trim levels will be available from September including Alfa Romeo Stelvio, Super, Speciale and the limited production Milano Edizione. At launch, drivers will be able to choose between two engine versions – 2.2-litre 210hp diesel Q4 AWD and 2.0-litre 280hp petrol Q4 AWD – combined with an ZF eight-speed automatic transmission as standard. The 2.0-litre 280hp petrol Q4 AWD engine offers best in class acceleration, going from zero to 62mph in just 5.7 seconds and onto a top speed of 143mph, while returning 40.4mpg* on the combined cycle and emitting just 161g/km* CO2. The 2.2-litre 210hp diesel Q4 AWD meanwhile, gives out 127g/km* CO2 and returns 58.9mpg* on the combined cycle, while still registering a top speed of 134mph and accelerating from zero to 62mph in 6.6 seconds. From September the Alfa Romeo Stelvio will also be available to order with a 2.2-litre diesel engine, producing 180hp and available in both Q4 all-wheel-drive or rear-wheel-drive, and a 2.0-litre petrol engine, with 200hp and Q4 all-wheel-drive. Featuring perfect 50/50 weight distribution, Alfa Romeo Q4 all-wheel drive architecture, best in class power-to-weight ratios and innovative engine and driver technologies, the Alfa Romeo Stelvio embodies everything a true Alfa Romeo should. Not only that, but the Alfa Romeo Stelvio can boast at being the lightest mid-size SUV in the sector thanks to its lightweight body structure and carbon fibre driveshaft, coming in at just 1,604kg for the 2.2-litre diesel 180hp RWD and up to 1,660kg for the 2.0-litre petrol 280hp Q4 AWD, only adding an extra 56kg for the all-wheel-drive system (AWD). Finding the perfect balance between driving experience and safety, the Alfa Romeo Stelvio was recently awarded a coveted five-star Euro NCAP rating with a score of 97 per cent for the protection of adult occupants; the highest score in its category. Credited for its host of innovative safety systems, which come as standard across the full range, the Alfa Romeo Stelvio boasts Alfa Romeo’s segment-first Integrated Brake System, Autonomous Emergency Brake with pedestrian detection, Blind Spot Monitoring, Forward Collision Warning and Lane Departure Warning. The all-new Alfa Romeo Stelvio stands out from the crowd thanks to its distinctive Italian design, expressed through its proportions and technical architecture leaving the impression of sophisticated simplicity and quality surfaces, both inside and out. From launch customers will have a choice of three trim levels and a limited production Milano Edizione. The entry trim level ‘Stelvio’ offers a comprehensive standard specification. Standard exterior features include 17-inch 10-spoke alloy wheels, LED rear lights and a double lateral chrome exhaust pipe. Inside, the cabin focuses on driver satisfaction with dual-zone climate control, Alfa™ D.N.A. rotary driving mode selector, a 3.5-inch TFT colour cluster instrument panel, UConnect™ 8.8-inch display infotainment system with DAB plus Bluetooth/AUX multimedia connectivity, an eight-speaker audio system and two front and two rear USB ports. A multi-function leather steering wheel, houses all the main controls so the driver can focus on the task at hand. The standard specification on the Alfa Romeo Stelvio trim level is supplemented on the Super version with a host of exclusive interior and exterior features. Exterior wise, the Super trim level adds 18-inch 5-spoke alloy wheels and front parking sensors. The interior of the Super features an 8.8-inch infotainment system with 3D navigation system featuring European maps and 7-inch TFT instrument cluster, as well as a two-tone leather dashboard and leather and cloth upholstery. Building on the Super trim, the Speciale features 19-inch 10-spoke alloy wheels with red brake calipers, chrome window surround, Bi-Xenon 35W headlights and power folding door mirrors. Inside the cabin, the Speciale benefits from heated front leather seats with six-way adjustment and dedicated four-way power lumbar controls. Aluminium shift paddles on the steering column co-ordinate with the aluminium interior finishing’s and metal pedals to complete the look. The Alfa Romeo Stelvio launch edition, Milano Edizione, offers customers even more functionality and style, while providing exceptional value for money. From 1910 to 1960, the iconic Alfa Romeo Badge encompassed the word ‘Miliano’ in its design, the birthplace of the brand, the origins of which are echoed in the Milano Edizione. The standard specification, adding to the Speciale trim, includes sporty leather seats, a 10 speaker Sound Theatre, 20-inch V-Spoke alloy wheels, keyless entry and an Athermic windscreen. Privacy glass with black gloss window surround, electrically adjustable and heated front seats and a rear-view camera with dynamic grid lines enhance the standard specification. The Alfa Romeo Stelvio will be in showrooms from September, with prices starting from £33,990 OTR for an Alfa Romeo Stelvio 2.2 180hp Diesel RWD. To stay up to date on the all-new Alfa Romeo Stelvio visit www.alfaromeo.co.uk/keep-me-updated-Stelvio or to locate your nearest Alfa Romeo dealer visit www.alfaromeo.co.uk/find-a-dealer.